PYR-41 is the first cell-permeable inhibitor of ubiquitin-activating enzyme E1, with no activity at E2. (D) Ubiquitination level of Htt protein was detected by immunoprecipitation with the GFP antibody and western blotting with the ubiquitin antibody from GFP-Htt(Q74)/PC12 cells treated as (C). Total Htt protein level served as the loading control. (E) GFP-Htt(Q74)/PC12 cells were treated as (C).Soluble Htt protein was detected by western blotting and quantified. Mean ± SEM, n = 5, ***p < 0.001 compared to the control group. (F) GO binding assay of GFP-Htt(Q74)/PC12 cells treated with GO, followed by Western blotting (left panel) with the ubiquitin antibody and Coomassie Brilliant Blue staining (right panel). L is the lysate before precipitation, while S and P were the supernatant and the pellet, respectively, after the precipitation. (G) Ubiquitination levels of Htt protein in supernatant lysate prepared from GO treated GFP-Htt(Q74)/PC12 cells with or without GO binding for 30 min. Nanoscale, 2016, 8: 18740-18750. PYR-41 purchased from Selleck. (A) Serum-restricted A431 cells were pretreated with PYR-41 for 30 minutes prior to stimulation with EGF for 1 hour. Cells were lysed and incubated with UBA01 ubiquitin binding beads. Samples were separated by SDS-PAGE and analyzed by western blot for PD-L1. (B) WCL was analyzed for total PD-L1 levels and activated EGFR levels (p-EGFR). Tubulin was used as a loading control. Neoplasia, 2017, 19(4):346-353. PYR-41 purchased from Selleck. Yang Y, et al. Cancer Res, 2007, 67(19), 9472-9481. Kapuria V, et al. 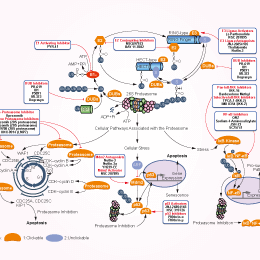 Biochem Pharmacol, 2011, 82(4), 341-349.